I always use the Dallas, TX speed test, since it's located near all our dedicated servers. Of course this doesn't tell you if it's spiking, but you see if any or both of the download/upload speed tests fall below 128 kbps. Lock-On flying will suffer especially while using voice comms when that happens! 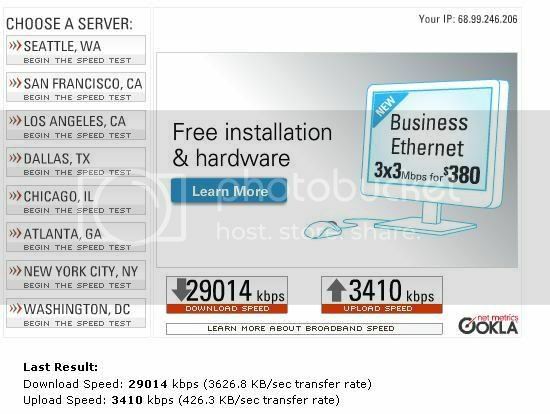 Via Speakeasy's server and from home I average 11,520 kbps download and 960 kbps upload speed. Between most hotels seems like sub-1,000 kbps download and roughly 256 kbps upload speeds are usual. The Wi-Fi @ Orlando Intl has ballpark speed of 5,000 kbps download & upload. It rocks, especially upload! It doesnt ask you for your location so I'm assuming that it uses the closes Verizon server to you. Just ran a random speedtest on my connection in Orlando, FL to the Dallas, TX server during off-peak hours and these are the results. (BTW, this is during our normal practice time around midnight eastern). You can finally start to call "High-Speed"... well, High Speed!!! Last edited by Lawndart on Mon Apr 28, 2008 4:04 pm, edited 1 time in total. You've got to be kid'n me !! This is mine updated Nov 6 2009. Last edited by Redeye on Fri Nov 06, 2009 2:26 pm, edited 1 time in total. I got 4798 down and 346 kbps up on my laptop wireless connection...4803 down and 352 kbps up on my flight rig with wired connection...havent checked the server yet...but im guessing its about the same. Those numbers are using the Dallas server, which is the closest to my location. Suffice it to say, I envy LD's connection speeds bigtime. Road Runner recently upgraded their "Turbo" package with faster downloads, but more importantly upload speeds doubled. @Burner, I know you posted yours elsewhere a few days back and I just now got around to testing my own. . . WOW! You weren't kidding. Last edited by Lawndart on Wed Jul 11, 2012 4:30 pm, edited 1 time in total. Very nice speeds Lawndart. I'm just in the middle! I win! Comcast has really boosted our pipes here. I "see" your test and raise you 4 more MB of download from my last test! I'm really going to miss this line in 4 months when I have to move back home. Now if I only had a better rig!!!! With those speeds, I think you're guilty of commiting "puter abuse" if you say your rig is the bottleneck. Hey Con... I didnt know your Commodore 64's rotory phone dialup could go so fast.